Nothing quite comes close to the brilliance of a beautiful diamond. The sparkle that defines a diamond depends upon four major factors: the colour, cut, carat and clarity. All four of these factors are amplified in every diamond by many types of diamond treatments. The first step to buying a perfect diamond ring is to understand that there is no such thing as a ‘perfect’ diamond. A completely flawless diamond is close to impossible to find and even if it did exist, it would be priced astronomically high. However, there are many ways to make sure that your diamond is pretty close to being perfect. Here are the four factors that will help you determine the quality of a diamond. Diamonds might look colourless to you, but many of them have subtle tinges of colour that isn’t immediately apparent. The highest quality diamonds are always colourless. As you go down the price scale however, slight hues of brown and yellow appear on the diamonds. The colour of a diamond plays a big role in the sparkle factor. If a diamond is truly colourless, it will be able to reflect light much better. That being said, most people can’t really detect any tinge of colour diamonds, so you can get away with paying less for a diamond ranked lower on the colour scale. If price isn’t a concern for you, choose diamonds that are graded between D to F. These diamonds are the most colourless and thus, tend to be priced higher. Diamonds rated H, I and G are mostly colourless, but have a slight coloured tinge to them when you examine them against a white background. These diamonds are perfect for you if you’re on a budget, but still want a beautiful diamond. The colour of these diamonds isn’t much of a concern because they will be embedded into a metal anyway and so the colour won’t show up. The lower down the colour scale you move, the more colour is present in the diamonds and the lower the price is. Fire: The fire of a diamond measures how much light flashes through the diamond due to light refraction. The perfect balance of these three factors gives a diamond its signature sharp look. 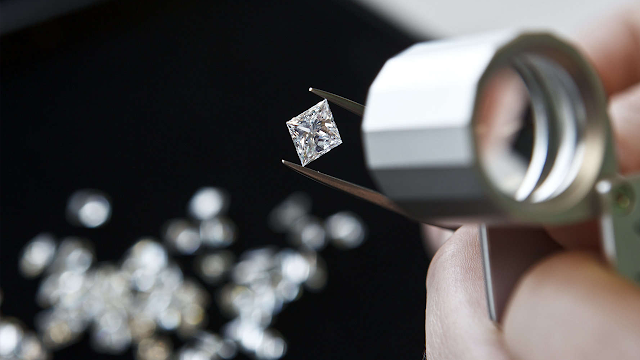 Diamond graders use a 10-point scale to measure the diamond cut quality. A diamond graded 0 is labelled ‘ideal cut’ and is both very rare and very expensive. A diamond graded 1 is labelled ‘excellent’, while a diamond graded 2 is labelled ‘very good’. The lower down the scale you go, the lesser is the cut quality. To determine for yourself if a diamond is cut well enough for you, examine it under indoor lights and outdoor lights. A well-cut diamond will reflect this light very well, making it look sparkly. FL: FL stands for Flawless diamonds, diamonds that have no imperfections. IF: Internally Flawless diamonds don’t have any blemishes on the inside but might have a few surface inclusions. VVS1 and VVS2: Very Very Slightly Included diamonds have minor surface inclusions, but these are usually not visible to the naked eye. S1 and S2: Slightly included diamonds also have surface imperfections, but they’re only detectable under a microscope. I1 I2 and I3: Included diamonds are of poorer quality and have inclusions that you can easily see even without a microscope. While the other 3 C’s are subjective and depend upon who is inspecting them, carat is completely objective. The carat weight of a diamond is the measure of how much a diamond weighs on a digital scale. The carat weight usually includes decimals, but some retailers round it off so they can price it higher. While a higher carat weight generally means a more expensive diamond, you cannot blindly choose a higher carat diamond. The carat weight doesn’t exist in a vacuum; the quality of the diamond also depends upon the other three factors. A higher carat diamond with a poor colour and clarity grade will be less valuable than a lower carat diamond with excellent colour, cut and clarity. So make sure you examine the diamond from all aspects before you buy it. Some retailers often forge the grades for their diamonds so they can price them higher. You shouldn’t take a retailer’s word completely for the quality of their diamonds because they aren’t always reliable. Make sure you ask your retailer for a certificate of the diamond’s quality by a third party. A third party examines diamonds and objectively grades them according to colour, cut, carat and clarity. You should also always ensure that you buy ethically-sourced diamonds since many diamonds have bloody histories attached to them. At Zaamor, all of our diamonds are certified by reputable organizations and are 100% conflict-free. Now that you know exactly how to spot a beautiful diamond, find the perfect one for you at Zaamor. All of our diamonds are certified, ethically sourced and undeniably beautiful. Explore our collection today to immerse yourself in a world of breathtaking diamonds. Also find out how to pick the perfect diamond stud earrings so you can’t go wrong with your choice.